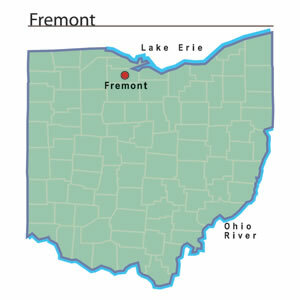 Fremont is the county seat of Sandusky County, Ohio. It was originally known as Lower Sandusky. Lower Sandusky had its beginnings as a village of the Wyandot natives. During the 1750s, the French constructed a trading post to participate in the fur trade with the Wyandots. During the late 1700s and the early 1800s, other colonial settlers moved into the area. Elizabeth Foulks and James Whittaker were some of the first white people to live in Lower Sandusky. They were captives of the Wyandots and fell in love. They married in Lower Sandusky in 1785. Like the residents of Upper Sandusky, the white people who settled here were in direct violation of the Treaty of Greeneville. During the War of 1812, the United States Army considered removing these people from the land by force. The soldiers did not carry out the threat. Fort Stephenson, an important American military post, was also built here during the war. Although the Wyandots still called Lower Sandusky home, by the 1830s, the community had a sizable white and African American population. Many of the African Americans were runaways and sought safety by living together. Throughout the 1830s, 1840s, and 1850s, slave hunters passed through the area looking for runaways.